I want to tell you more about public transportation. In a way, it's great. It's more common and more accessible (unless you're handicapped) than in many American cities. 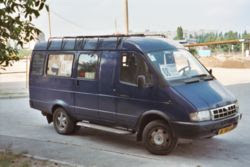 The most common ways to travel are on a bus, or a marshrutka. What is that? Well, a big van, full of very small seats, none of which have a seatbelt. The idea seems to be to fit as many people as possible inside, so seats are turned every which direction. There is often a pole running from floor to ceiling. If you are unfortunate enough to climb in when all the seats are taken, you and your drunken friends can just stand/scrunch under the ceiling and hold onto the pole until you reach your stop. I have mixed feelings about the marshrutka. I appreciate its originality and functionality. It is uniquely Russian in the same way that no one, of any age, ever wears a seatbelt in a car. Ever. My decision to do so is viewed with the same shock as my insistence on drinking tea without sugar in it. But, they're not very safe. I haven't had any problems, but there are stories of vans flipping over from carrying the weight of too many people. 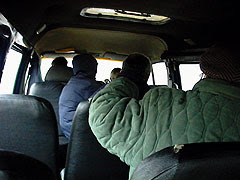 News stories actually comment on the safest place to sit on a marshrutka (behind the driver's seat). Some pictures from others until I post my own. Ah, yes, but the seat behind the driver is the worst, if you don't want to be stuck passing money up and down the whole way there! Ah, the Marshrutka, I miss those things, but not nearly as much as the private taxi services often referred to as "gypsy cabs"